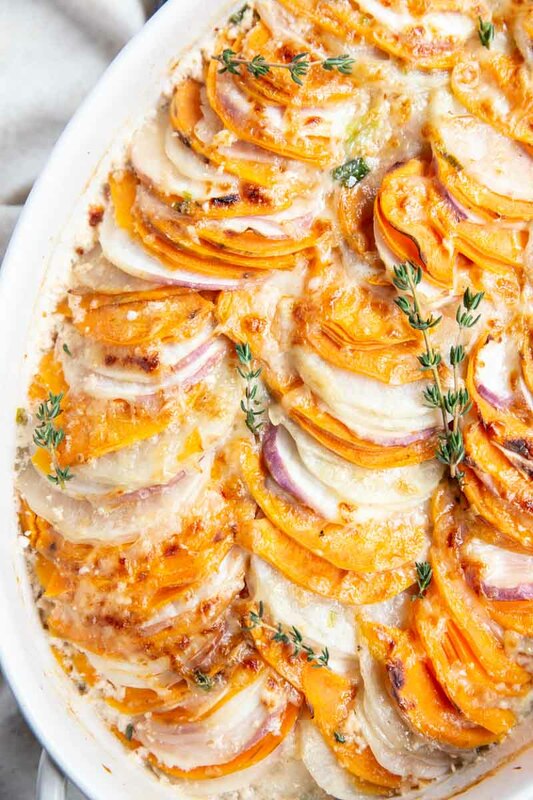 Gratin made with potatoes and root vegetables are a new must as far as Thanksgiving side dish recipes go. This potato au gratin with gruyere is super cheesy yet also gluten free made with Bob’s Red Mill gluten free flour. 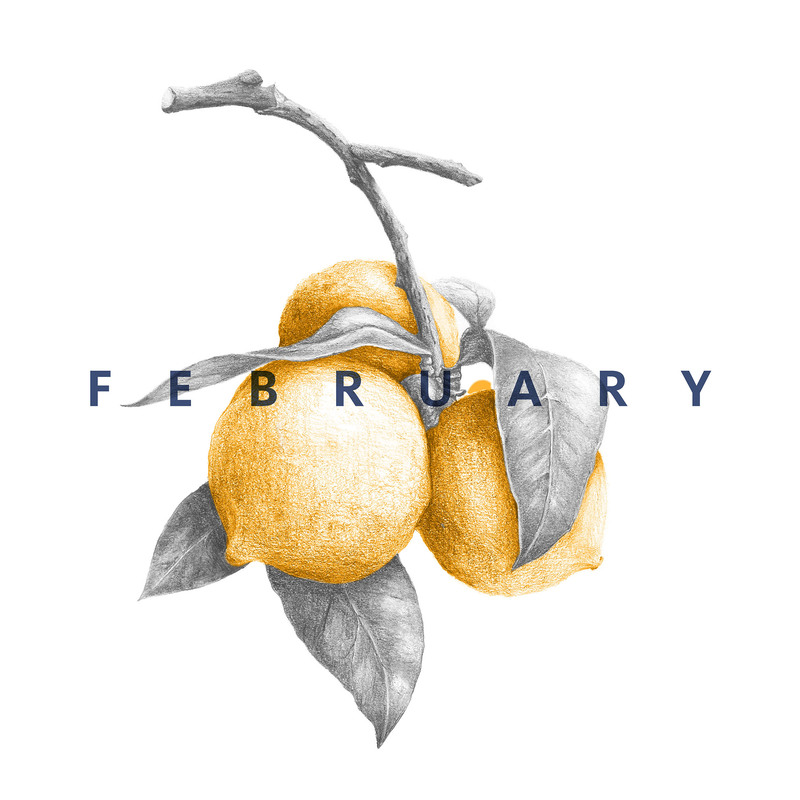 Victoria a local chef in Salt Lake City is a genius when it comes to healthy, seasonal recipes. 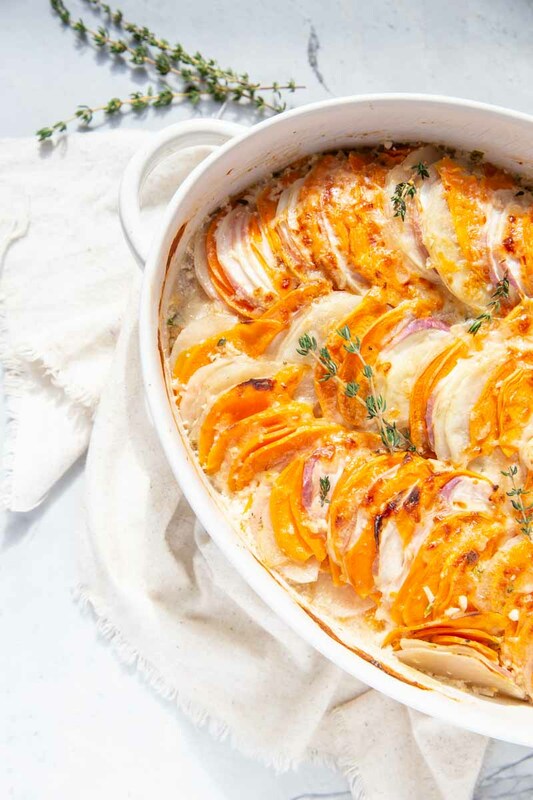 She originally gave me the idea for this delicious root vegetable gratin recipe years ago at a small gathering we created together around holiday dishes. 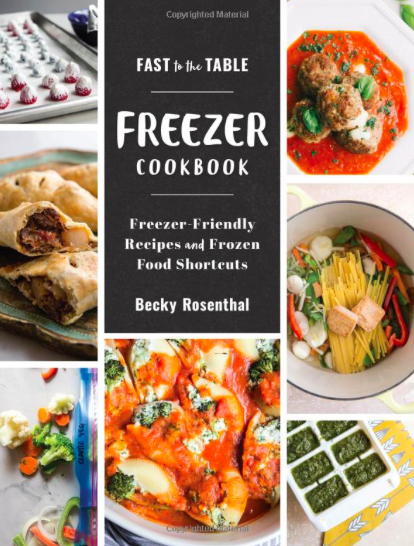 All of her recipes from that evening were amazingly delicious, using seasonal vegetables, and healthy substitutes, but this one was a favorite. Since then, I’ve been altering this recipe every year, adding this or that, trying out different cheeses, and now also trying with with a gluten free flour. This updated recipe is my favorite thus far. The gruyere cheese really puts it over the top. 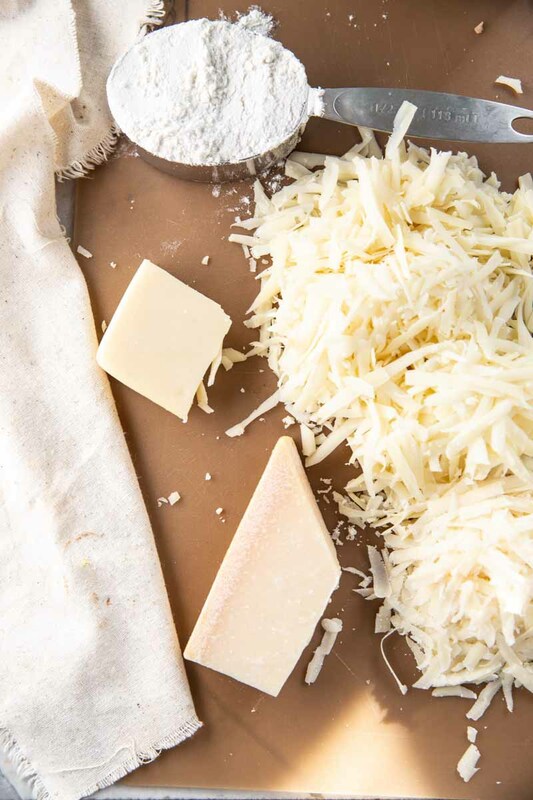 When making au gratin from scratch you need a few simple ingredients, root vegetables of any type, cheese and seasonings. 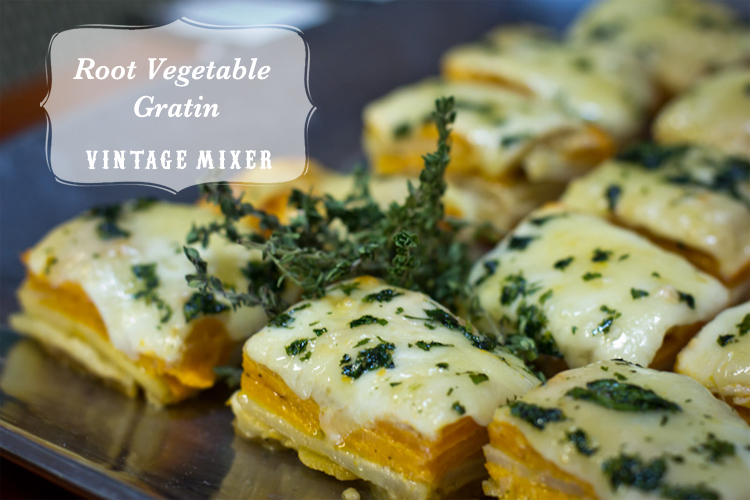 The secret to making au gratin from scratch is using a food processor to thinly slice all of the potatoes and root veggies. This speeds up the process tremendously. Make sure and slice up the potatoes right before you’re ready to use them because if you do it too soon then they will start to discolor. 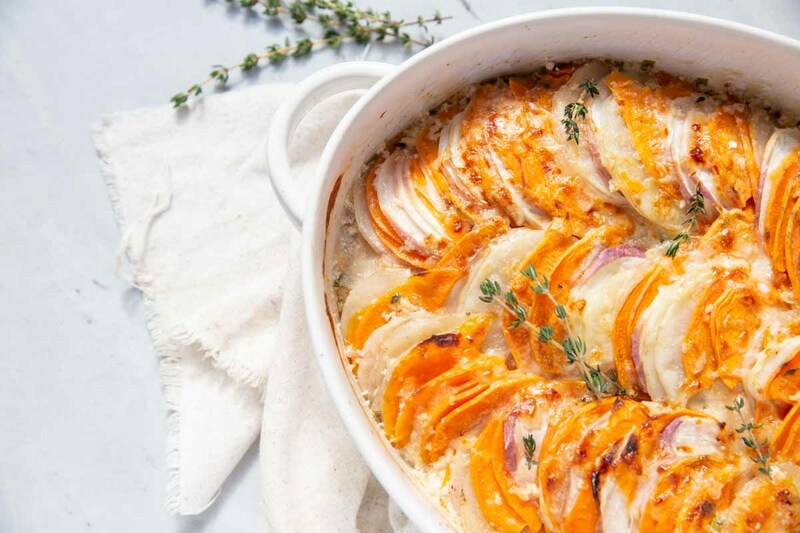 This root vegetable gratin recipe is actually quite simple and the beauty of it is, you can use whatever root vegetables you have on hand. Instead of the traditional, all potato gratin, this recipe has a blend of several root vegetables. If you don’t have celery root or maybe your just a little uncomfortable with the large gnarly brown root, try the pretty purple and white root vegetable- rutabaga or the slightly bitter turnip. 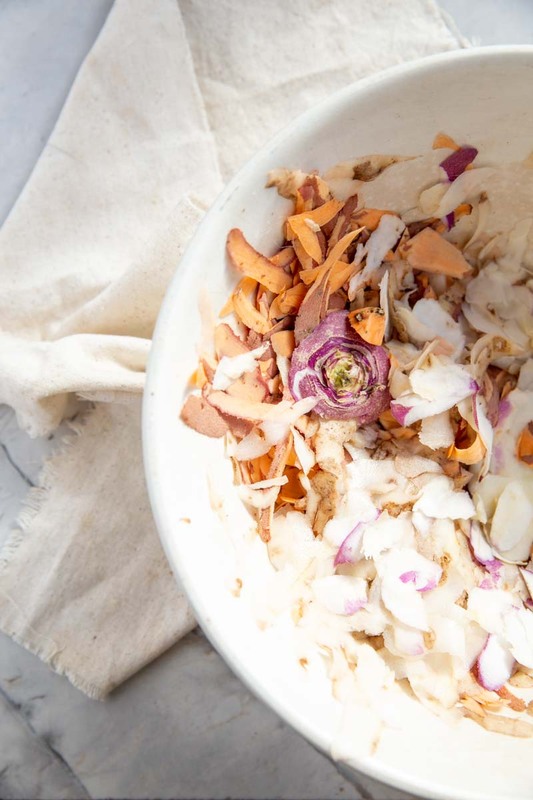 Rutabagas are slightly more sweet, while celery root taste similar to celery but more mellow, and turnips have a flavor similar to horseradish, which my husband loves. Most au gratin recipes are naturally gluten free. The recipe that I began with years ago has some flour in it to help soak up some of the half and half, and to cause the potatoes and veggie to stick together more. 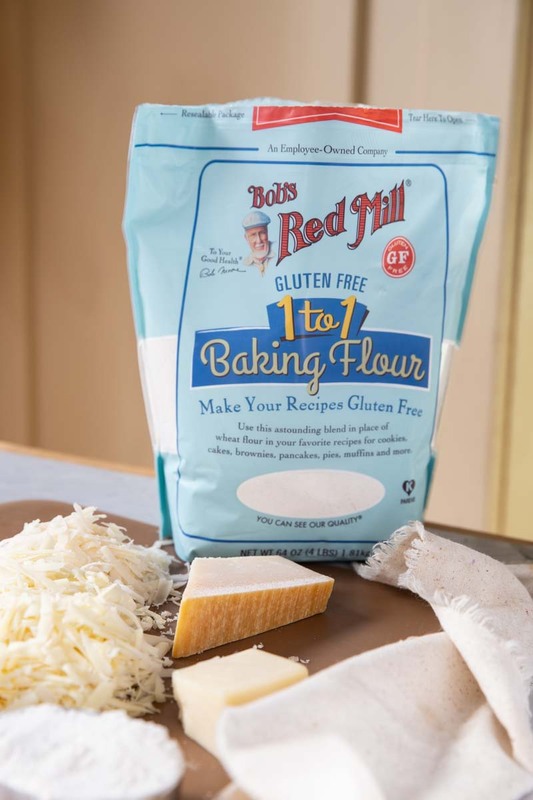 I have since altered it to use Bob’s Red Mill gluten free flour which works perfectly find and doesn’t add any extra flavor or texture. 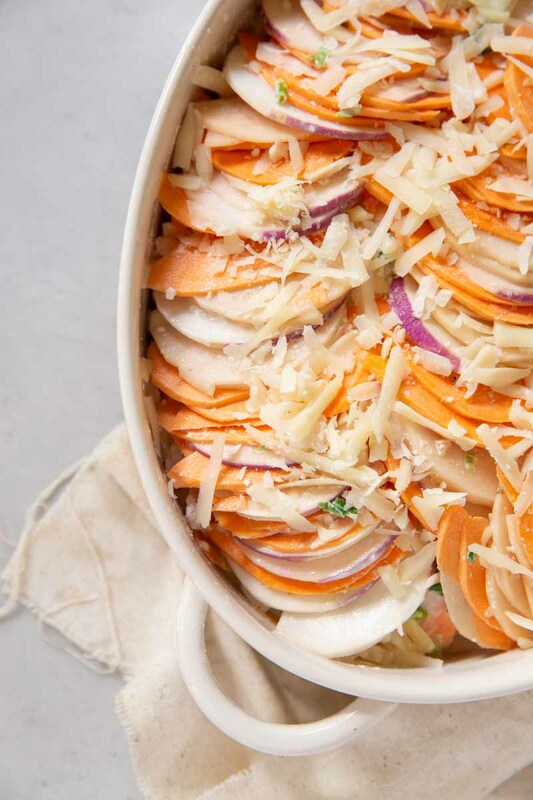 This layered root vegetable gratin has been a crowd pleaser ever since first creating it years ago for our gathering and it has even gotten better over the years. 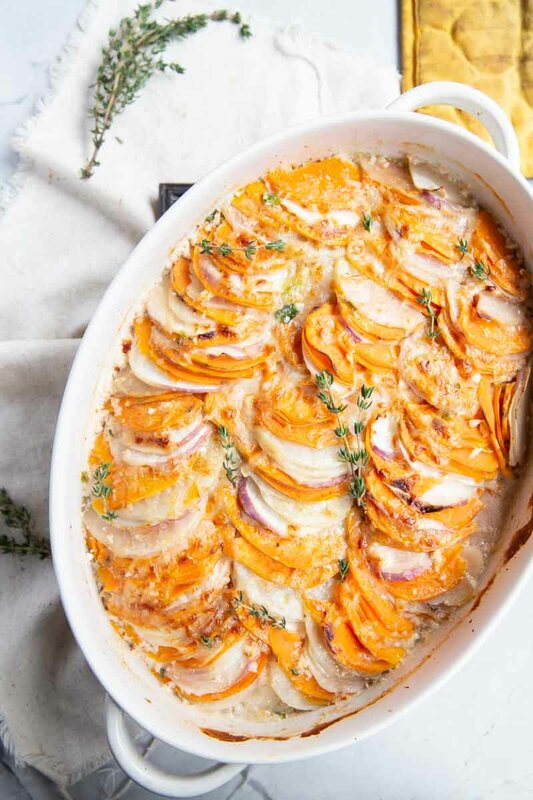 A healthier version of potato au gratin using root vegetables and gluten free flour. Use a food processor to thinly slice up the potatoes and root vegetables. In a small sauce pan combine the half and half, scallions, garlic, chilies and herbs. Bring to a simmer. Add salt and pepper. Set aside. Layer sweet potatoes in a baking dish coated with pan spray. Sprinkle with 1 tablespoon of gluten free flour. Add a layer of cheese. Pour some of the half and half mixture over the potatoes. Add a layer of russet potatoes, flour and some more cream. Continue layering until all of the potatoes, root vegetables, flour and half and half have been used. Top vegetables with remaining grated cheese. Cover pan with aluminum foil and bake in over for 50-60 minutes. Remove foil for the last 10 minutes of cooking. Remove from oven and serve. 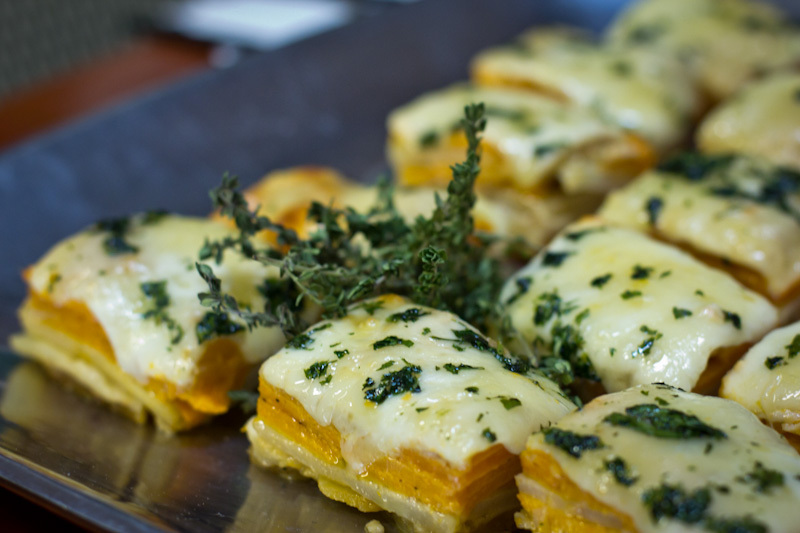 The gluten free flour in this recipe helps the gratin set and stick together. Gluten free flour and all purpose flour may be used here interchangeably. Can you make this without the flour? Yes, or you can use a gluten free flour or flour substitute like almond flour. Hope that helps. Th s sounds so delicious and I love the added heat from the chilies. Wonderful vegetarian recipe. I saw this on google+ thanks! oh my word, this looks DIVINE! I love the plating! Definitely may make our holiday table. What fun! ( I find myself having chef crushes as well.). My grandparents are coming over for dinner yesterday and this dish was the first thing that popped into my head to make. I cannot wait just going to lighten it a little by substituting coconut milk creamer for half and half. Hope I don’t ruin it but doing that! Can’t wait to try! What size pan do you recommend? Anna, a 9 x 13 rectangular pan will be perfect! Enjoy! What herb did you sprinkle on top? It’s thyme and oregano! Hope you enjoy! Curious, can this be made without half-and-half? We don’t have a need for it except with this recipe so I’d hate to waste the product. thanks! That’s a great question. You could try whole milk, cream, or maybe even yogurt if you have any of those around. I usually substitute dairies all the time with whatever I have on hand though I haven’t tried it with this specific recipe. Let me know what you end up trying and how it works!